Whether you call it Meatless Mondays, Weekday Vegetarianism, or Flexitarianism, switching up how you eat in order to try to reduce your meat intake is a trend these days. In some circles, it's seen a trend among millennial for 2018--especially when it comes to "plant-based meat alternatives." It's not a new concept, and in fact, there are resources galore on the subject on the web. Some fingers (like Peggy Neu, in the TEDxManhattan video below) point back to the rationing Americans (and Europeans) did during World War II. Items like meat, cheese, butter, cooking oil, processed food, and more were rationed, making it necessary to get a little more creative in the kitchen. 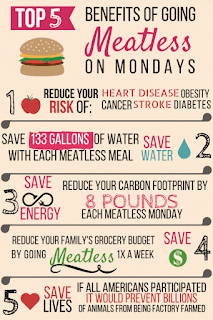 Here's a multitude of resources to "make Monday the day all health breaks loose:"
Meatless Mondays, from the non-profit Monday Campaigns and the Center for a Livable Future (CLF) at the Johns Hopkins Bloomberg School of Public Health. Here you will find resources for a variety of perspectives: restaurants, K-12 schools, hospitals, food service, campus, community, and corporate dining. Included here are implementation guides, free resources, and recipes. The Greenpeace Less Is More Movement. FoodTank details the specifics of Greenpeace's report here, including a recommendation for a 50% reduction in meat dairy by 2050. The Less Is More website does a nice job of detailing the planetary effects of eating less meat to climate change, forests, water, health, animal welfare, and fair food... as well as ways to take action. Earth Day Network made Meatless Mondays one of their 2018 "Taking Action" points for Earth Day 2018. There, you can get some key points as well as a pledge to help you deepen your commitment. 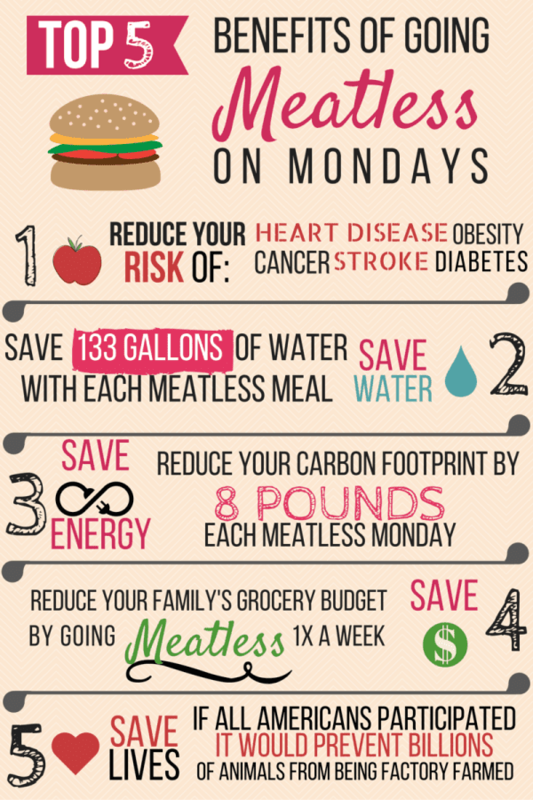 It's even an entire Pinterest category--just search there for "Meatless Mondays"
At the very least, it gets us in the mode of thinking about eating a little lighter, in healthy ways, in ways that help our our planet.